Along with our feathered staff, Conservationist and Master Falconer Dale Arrowood of Winged Ambassadors will give you a live and exciting show with our Birds of Prey Show! 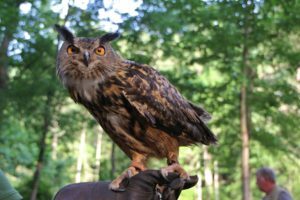 Enjoy live flight demonstrations as you learn about Georgia’s indigenous birds of prey. ****Show dates are subject to change, so call ahead before coming out to the show! Meet Liberty – Our Newest Feathered Staff Member! Come out and meet our new Staff member, “Liberty”! She is a beautiful Bald Eagle and is an imprinted raptor with visual problems that prevent her from being released into the wild. If she were released, she would die. Liberty arrived on July 31st at our conservancy. She has already captured our hearts and we all love her. She is beautiful and definitely sassy with a mind of her own. She would love to meet any and all who care to come out and see our educational live bird of prey show! Dale continued to work and hunt with his birds of prey while serving in law enforcement. After 27 years in law enforcement, Dale was forced to retire due to a cervical injury. However, his injury did not stop his work with raptors. Czar is a Eurasian Eagle Owl. The Eurasian Eagle Owl is larger than most hawk species. Czar can grow to be as big as 22″ long and have a wingspan of 41″. The Eurasian Eagle Owl is commonly found in North America, Europe & Russia. They are native to a Woodland habitat. They hunt small birds and mammals. They can attain sizes of 30 inches with a wind span of 6’2″. Their flight territory range is 1500 to 10,000 acres! They are very territorial and will attack bears or wolves if they come near its nest! When they find a mate, they are mates for life. In ancient times, the Eurasian Goshawk was considered a sacred bird and only allowed to be flown by nobility for falconry or hunts. Even with colder climates, these owl are very territorial do not migrate to warmer climates in winter. These owls can live up to 20 years in the wild and a distinct feature are their red orange eyes. The most widely distributed of the owl species, it is nocturnal and needs open spaces to hunt. Barn owls do not hoot but “screech”. Since many choose to nest in barns and old abandoned buildings, many an intruder has been scared silly by the eerie screech of these owls. 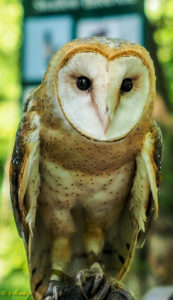 Barn Owls mostly eat rodents and small mammals and can live up to 30 years old. 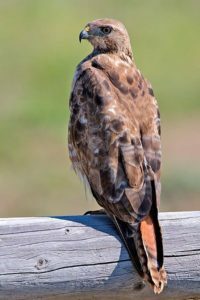 One of the larger raptors in North, Central and South America, red tails can be recognized by their distinct shrill cry. Red tails will mate at 3 years old and will mate for life. They hunt in pairs and will fight over food even in the air. Red tail eggs are Green inside! They can’t move their eyes and so must move their heads in all directions to see. 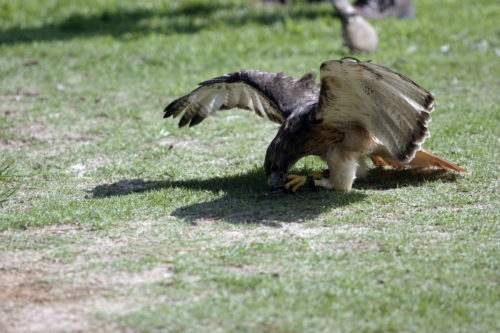 Many birds of prey, including hawks and falcons, practice mantling after a kill. While they are feeding on the ground, particularly in open fields, rocky ground, or similar areas with less shelter or cover to provide natural concealment, they are more exposed. Their instinct is to cover their prey and keep it out of sight so it is not stolen by a larger, more powerful predator, whether that is another raptor or any other type of lurking hunter or scavenger. At the same time, the mantling bird will eat rapidly in order to decrease the time they are vulnerable, storing large bites of meat in their crop for later digestion when they feel more secure and are not at risk of losing the meal. If you come across a raptor, do not approach until it is finished. The bird may attack the one approaching or leave its food, which will be a waste. Springtime in the Snake Creek Gorge at Banning Mills presents a diverse and beautiful array of wildflowers and plants. Every season at Banning Mills affords a beautiful nature experience on the historic and unique nature trails. We are not a park. All guests must register at the front desk before accessing any trail systems. 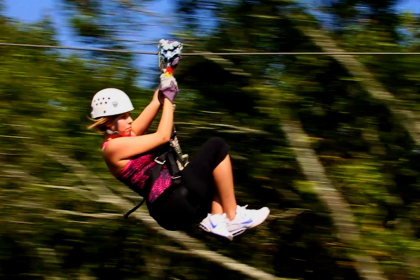 There is a $4.00 per person charge to hike the trails. All Proceeds are donated back to the conservancy. Reservations are not required for the Bird of Prey Show. Please check in at the front desk 20 minutes prior to show start time for your map.